To be honest several story mappers use top-level cards as user card and visualize user steps on the second level. Can the persona feature help for those? The answer is definitely YES! So let’s go to create personas. Read more about creating personas here. Create the first persona, Harry. He’s a regular buyer, he takes the whole journey using the product. 1.User activities are milestones where the user’s mindset change. Try to describe users’ mindset and behaviors at every stage, you’ll find differences. Use this additional information to prioritize features or to improve the user experience. 2.Dive deep into a selected part of user’s journey. You can easily hide other non-relevant activities. Narrowing your scope lets you discover missing steps or additional ideas. This feature lets you handle which you have never done before in StoriesOnBoard… to visualize user journeys. For example, you can segment your users into regular buyers and impulse buyers in a webshop project. Create different personas according to these behaviors. By Retelling the story of these two personas you’ll recognize they make different steps during the progress. The impulse buyer won’t browse product categories or compare products. She will buy a highlighted product after discovering it on the main page. 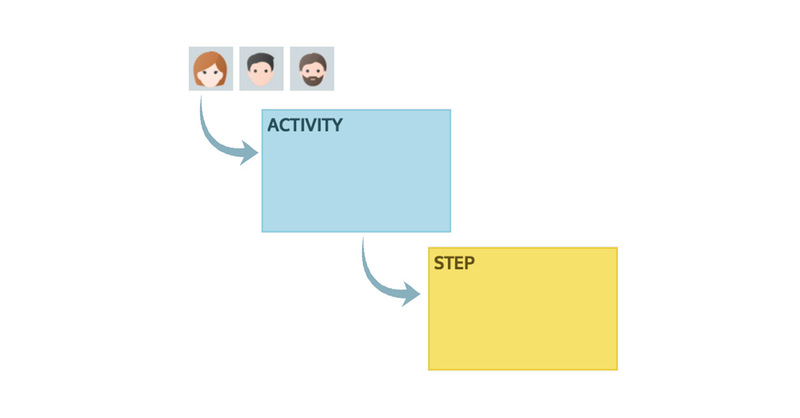 Assign personas to activity cards following their journey. Because you can filter out non-relevant steps when focusing on a selected persona. If you had duplicated user steps earlier, then merge journey into one and assign to your brand new personas. What’s on a persona card? I think it’s great to have personas in here. How would you recommend using this feature however when some of the individual cards would be for different personas ? eg perhaps in your example all of my personas would purchase a product, but one would use paypal, one would do a bank transfer etc and I would want to assign different personas to Paypal/Bank transfer etc. Thanks for the question. I recommend you to use card color as a second level (dimension) of persona. In our example, the “regular buyer” and the “impulse buyer” take a different journey, but they make same steps too. (eg: purchase). If you use card color as “sub-persona” eg: “pays with bank transfer” and “pays with PayPal”, you would visualize these different behaviors. In some cases, you’d better swap dimension. It depends on the project. TBH: it’s like lifehacks, but can be useful.